Put one in storage for memories. Send one to relatives. 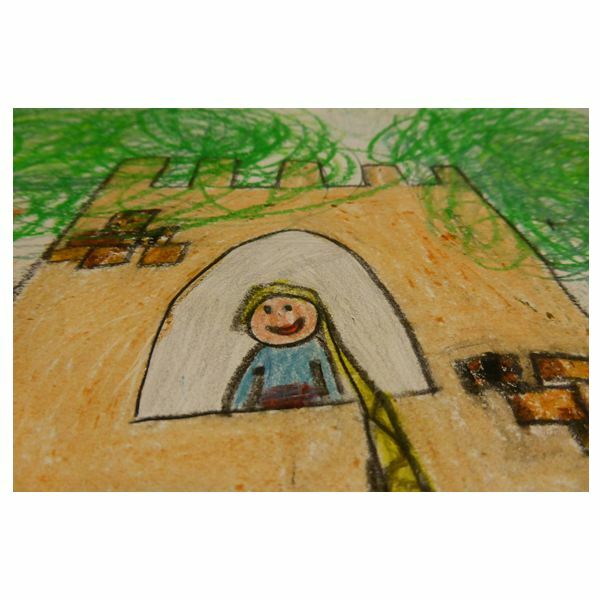 Grandparents will be thrilled with a piece of your child’s artwork. Use large sheets of artwork for gift-wrap. And, like any other sorting program – one for the trash. Transform a hall, walkway or entrance area as your “art hall of fame.” Display your children’s work at the child’s eye level for all the family to see and praise their efforts. Think about using the bedroom hallway for this task and change the artwork monthly. Make sure to name and date each drawing before attaching it to the wall. There is a variety of no-mess, no-residue adhesives that will not mark the walls when you take down each month’s art. You may want to choose favorite piece of artwork from each grade level and frame it. Pick a room and shower it with very famous artists in history – your children. Purchase fashionable frames (that fit your décor) when they go on sale at your favorite stores and save them for special projects from the kids. One idea is to take a quilted wall hanging and sew loops of fabric along the top edge. Insert a curtain rod and hang this on the wall. It’s easy to tape or pin your children’s weekly or monthly artwork to the fabric and display their artwork in a cozy spot in your home. This display banner makes it easy to change pictures easily and often. Laminate your precious drawings between two sheets of clear adhesive paper. These make unique placemats for the table and they can be cleaned easily with a damp sponge. Such an easy project to make and they can be changed often, saving the old ones in a large box or plastic bin for storage. Think about using holiday drawings to bring in the spirit to your dining area. Today with the use of technology, you can easily scan your child’s drawings to your computer. Or take digital photos of each piece. Burn each year’s artwork on CDs. This is a great way to save a lot of artwork in a small space. Not only can you view these disks on your computer, but hook it up to your television and have an end-of-the-year art review via a slideshow for the entire family to enjoy. There are apps for your computer, tablet and smart phone that you can get free or purchase for a small price to store your child’s artwork.